The articles in this volume trace the development of the theory that humanity forms a single world community and that there exists a body of law governing the relations among the members of that community. These ideas first appeared in the writings of the medieval canon lawyers and received their fullest development in the writings of early modern Spanish intellectuals. Conflict and contact with ’the infidel’ provided a stimulus for the elaboration of these ideas in the later Middle Ages, but major impetus was given by the English subjugation of Ireland, and by the discovery of the Americas. This body of work paved the way for the modern notions of an international legal order and universal norms of behavior usually associated with the publication of Hugo Grotius’s work in the seventeenth century. 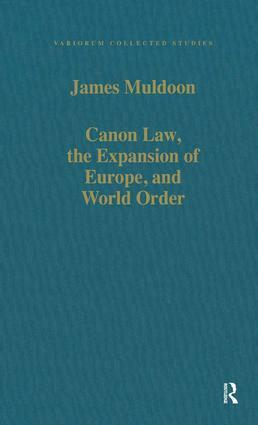 Contents: Canon Law and Expansion: Extra ecclesiam non est imperium: the canonists and the legitimacy of secular power; A canonistic contribution to the formation of international law; The contribution of the medieval canon lawyers to the formation of international law; Papal responsibility for the infidel: another look at Alexander VI’s Inter ceatera; The Avignon papacy and the frontiers of Christendom: the evidence of Vatican register 62; John Wyclif and the rights of the infidels: the requerimiento re-examined; The development of group rights. World Order: SolÃ³rzano’s De Indiarum iure: applying a medieval theory of world order in the 17th century; The conquest of the Americas: the Spanish search for global order. Ireland and America: Spiritual conquests compared: Laudabiliter and the conquest of the Americas;The remonstrance of the Irish princes and the canon law tradition of the just war; The Indian as Irishman; Index.